Adding the gateway creates a whole new world of opportunities.. The majority of physical machines lack the ability to web-communicate. Connected Molecules have developed a physical gateway with web services to retrofit web-connect existing machines for access management. The crossroads of machines, customers and transactions. Real time physically connected machines. And since the gateway is web-connected, we can add web services to existing machines and systems. Through our platform we can connect apps with machine transactions. Or combine POS transactions and machine transactions. This allows a wide variety of applications to enable possible peripherals of the machine. Connecting your vending & coffee machine to the internet is not visionary thinking anymore. Now you can gain access to every of your venues’ machines: find out which drinks sell best in what areas, how often your staff is cleaning the machine and how robust your machine is operating day-in-day-out. The system informs you also about preventive maintenance due, in order to avoid any downtime. Pay at the vending machine? Basically there are 2 options: cash or cashless. Ever since 1950’s vending machines have been able to interact with a so-called coin mechanisms; a device that processes cash money, and informs the vending machine, it has received x amount of cash, so the vending machine can deliver / produce the desired product. Since 2015 cash money is not always the preferred method of payment anymore, as it generates quite some operational issues (admin, security, handling). Cashless becomes the preferred method of payment, but this brings some extra technological challenges, as the variety of systems is enormous, hence forcing the vending operators to be able to integrate this into their vending solution. Open payment systems force the use of bank-approved electronic funds terminals (EFT). Every country has its own variety of approved EFT’s, hence a European roll out, mostly means a lot local integrations. 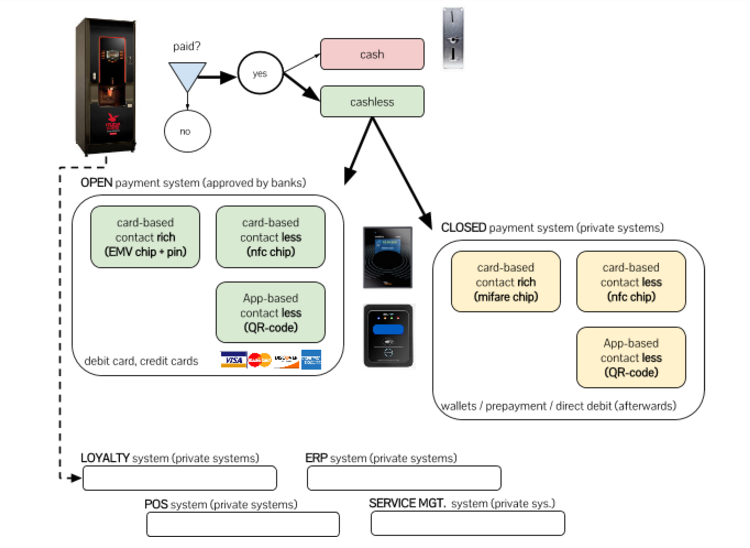 Closed payment systems always require an integration to an existing system that is not (necessarily) bank-approved. You will find hundreds of different systems at universities, schools, large companies, catering companies etc. Luckily as of 2016 some EFT’s are released on the European market that are certified to serve multiple open and closed payment systems with just one type EFT, saving greatly in hardware-, integration and maintenance costs. 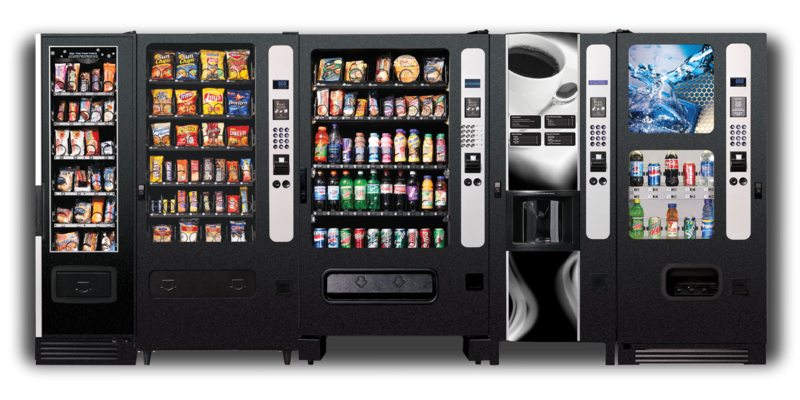 Connected Molecules not only connects the vending machine with an EFT, but altogether connects these devices to web services, enabling machine data to also interact with (customer proprietary) systems for Loyalty, ERP, Point of Sale and Service & Facility Management. Accept payments not only from different methods, but also combine payment methods. We can handle a unique catalog of > 2,500+ payment applications in > 170 countries via all mayor bank-card readers and payment providers. With us, you not only get the usability and efficiency of your machines, you can even go one step further and connect them to your network. Thus you gain insight in your food & beverage statistics, revenue, the machines cleansing signals. Information is your advantage and staying ahead of machine downtime at the odd moment to avoid lost sales is an easy way to make your chain operate better. Once data has arrived at our [gateway web service], we can through connect to other web based applications. We believe that actual functionality should come from web-based bits, and not from locally installed hardware devices. Bits are agile, swift, weightless and lightning fast. 2.. Data-feed the support-systems that in both the operators’ and their customers’ B2B back end systems. Auto- and manual cleaning programme execution, grinder adjustment, etc. We believe that is exactly what our customers deserve! The platform not only real time informs you what your machines sells, and where, you can also log yourself into the system and change prices on (self-service) machines centrally. The IoT-module uses established protocols and interfaces. It runs on standard software as can it deliver data to a tailor made-front-end interface or existing backend ERP-system. Self service, for one machine or a group of machines! Like to change machine settings, prices etc? Via our platform you can manage this via an easy to use and secure login via your internet browser. No matter if this is your workstation at the office or your smartphone at a meeting (or beach). For one machine or a group of machines! Use the cashier-receipt for payments at the vending machine or payment at a gate! Connecting your vending & coffee machine to the internet is not visionary thinking anymore. Now you can gain access to every of your venues’ machines: find out which drinks sell best in what areas, how often your staff is cleaning the machine and how robust your machine is operating day-in-day-out. The system informs you also about preventive maintenance due, in order to avoid any downtime. Need specific control systems? We even can link to any system you require*, provided it allows for effective data export. And we continue to add pre-integrated partners to our system all the time, to help you make your business work more efficient. Like to change machine settings, prices etc? Via our platform you can manage this via an easy to use and secure login via your internet browser. No matter if this is your workstation at the office or your smartphone at a meeting (or beach). ‘Hi Joan, it’s 10:45 already, why don’t you drop by, and I’ll make you a nice Latte Macchiato. If you come to me before 11:00 here’s a voucher for a 30% discount. See you soon, Albert your dedicated coffee machine’. If we web-connect the machines in a network, not only will real time machine data be available, enabling better service delivery and saving on field service costs. Independent of what token is used for consumer identification (barcode, nfc, debit card, app) we can track individual consumption behaviour simply by adding token-identification# to the orderlines. Operators can now jump over the vending machines and start to communicate directly with consumers, opening up a network of hundreds of thousands of consumers with buying power. Buying power that can also be used outside the vending area. And we have some nice ideas for game-ifaction of the vending area. We have data centers based in Europe, only you and our Database Administrators have access to your data. Your data is protected by backups, firewalls, anti-virus software, data encryption and independent security audits. In addition, physical security measures include multiple power supplies and internet connections to ensure maximum uptime; fire, flood, theft and intrusion protection. You are in control who can see your information, within our online platform you can assign locations, users, machines groups etc.